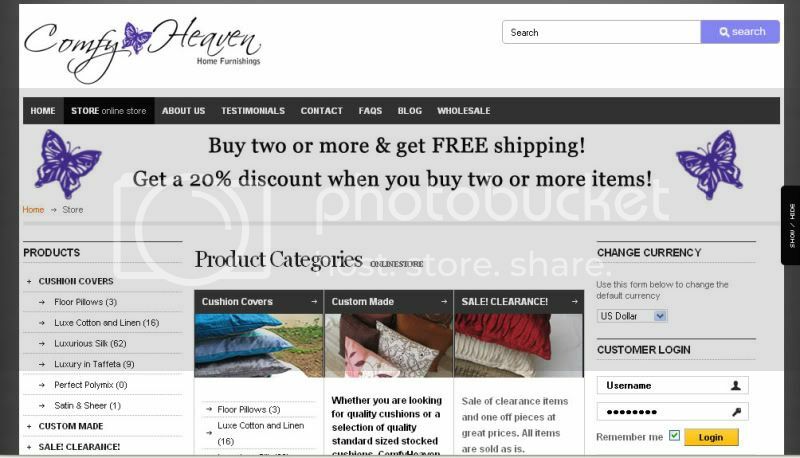 The Comfy Heaven Home Furnishings website has finally been launched ! Please take a look and let me know what you think. The setup of the site is pretty simple and straight forward. I have tried to make it as intuitive as possible, you can shop through item, price and colour, more options will be added soon. You can order off the site or use the contact form to send us custom orders. You can even customize our designs to suit your needs. We offer shipping world wide and you have to only pay shipping for your first item. There is also a nifty little show/hide panel , when you pick a cushion covers or item from the shop is automatically goes into this panel. When you place it on 'show' you can mix and match your furnishings on it quite easily. The site was designed by the lovely folks at joomcreative.com , who offered me just the best service and great imput. I am updating it with new products almost everyday so please keeping coming back. Currently I am offering 20% discount if you buy more than one item and you pay shipping only for your first item. Would love you opinions and feedback.